With spring finally here, if you are looking for family-friendly (and dog-friendly) hiking trails in the Merrimack Valley, don’t overlook Chelmsford’s Thanksgiving Forest (sometimes also known as the Thanksgiving Ground Forest). Its 45 acres abut Carlisle’s Great Brook Farm State Park to its south and the Russell Mill Pond to its west. The trail system is fairly simple to navigate at Thanksgiving Forest. There are two trails – the longer Bovey Trail, well-marked by blue trail markers, and the shorter Russell Trail – also well-marked, by purple trail markers. Thanksgiving Forest’s Bovey Trail will take you along the picturesque water views beside Russell Mill Pond where you may glimpse geese, ducks, and the occasional beaver lodge. The varied terrain on either trail is sure to provide plenty of visual interest. While there are some dips and rises in the trails as you trek along, and some rather impressive root systems running alongside and across the trails closest to the trees, the trails themselves are relatively easy to traverse, or, in simpler terms, you won’t have to carry your kids (or dogs) because they’ve given up on hiking halfway along the trail. Throughout the forest, you’re sure to see plenty of boulders, hilly terrain, and old farmers’ walls of stone along the way. Some of the pathways through the forest are quite peaceful, serene and seemingly remote, while others abut the backyards of South Chelmsford homes and whisk you back toward civilization. The forest offers some history too, for those who might like a story to go along with their hiking. The sign at the Janet Road entrance of Thanksgiving Forest tells the story of how Thanksgiving Forest, with its current 45 acres, came to be. When the Chelmsford Farms Estates development was almost finished in the early 1960s, more and more people were coming into the Thanksgiving Ground Forest in South Chelmsford. At the 1961 annual meeting, the town of Chelmsford accepted a small plot of land at the edge of Thanksgiving Forest on Gary Road for a parking lot from East Coast Builders. The town, at the same time, accepted a gift of land from Edward and Mildred Russell that added eleven acres to the forest, extending it along Russell Mill Pond to the Carlisle line; another gift of 6 acres from Martin Bovey that extended the forest past the large rocks, which had been the edge of the forest; and one other gift of about 5 acres from East Coast Builders which extended the forest’s border even further south. 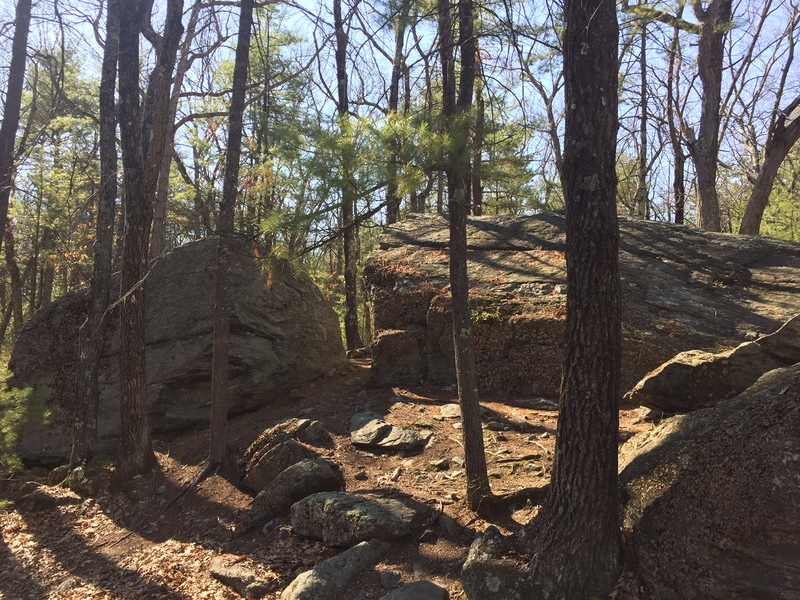 A view of the group of large boulders in Thanksgiving Forest, where the annual fox hunt participants once met in the 19th century. The hearth where fires are lit on the Annual Day Before Thanksgiving Walk. The fox hunts are long gone these days, but, about ten years ago, a new tradition started in the Thanksgiving Forest – the Annual Day Before Thanksgiving Walk. On the Wednesdays before Thanksgiving, during the early afternoon, those joining the walk meet at the forest’s entrance at the end of Janet Road and walk the trails within the forest to reach the same group of large boulders that once served as the meeting place for the fox hunt. At those boulders, a fire is lit in the hearth formed by the rocks and a local boy scout troop provides hot chocolate and cookies. It’s said that the walk has been attended by as many as 300 people in some recent years. The town of Chelmsford has found new ways to keep Thanksgiving Forest relevant and inviting to current generations, while remembering its history and importance to earlier ones. 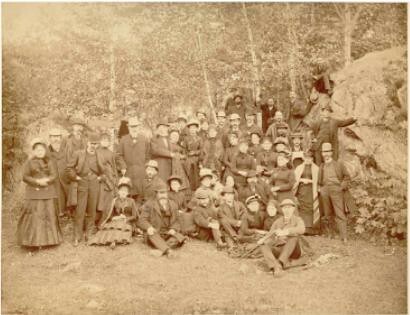 The photograph below, found on the Chelmsford Public Library’s Flickr Photostream shows a group of 19th century residents gathered for a Thanksgiving Day fox hunt. These days, Thanksgiving Forest offers great hiking trails that are family-friendly and the annual Day Before Thanksgiving Walk to those looking to add to their own family’s Thanksgiving traditions. Good one! Great entrance to great brook. Great trails! A Chelmsford treasure!